Good morning students and teachers. This is the first day after a long holiday. I think most of you will feel excited and happy for coming back to school. According to Chinese calendar, 2015 is year of the Sheep. Sheep is one of Chinese favorite animals. Sheep’s Chinese character is Yang. The Chinese character of Luck contains the . Therefore, Sheep becomes a lucky animal. The sound of Yang is same to Yang of the Sun. Yang means the positive energy in the universe. In Chinese New Year festival of the Sheep Year, Chinese like to mention san-yang-kai-tai , which means many (three) Yang energy bring up positive and cordial atmosphere. But Chinese like to replace by as in the Sheep year. 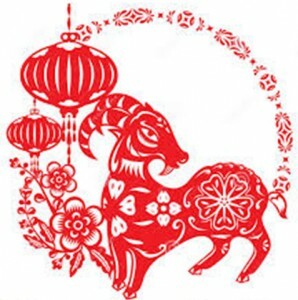 Ranking the eighth position of all the animals in Chinese zodiac, Sheep (Ram or Goat) represents solidarity, harmony and calmness. People born in the year of the Sheep are polite, helpful, and trusting. Like the rabbit, the sheep is also a kind of peaceful animals. They live with the green grass peacefully. But they are easily attacked by other animals if they go astray. Therefore, in the flock, they need to observe the discipline of the leader sheep well. In the bible, Jesus Christ hailed himself as ‘a Good Shepherd’ and we all are His sheep. 6 Surely your goodness and love will follow me all the days of my life,and I will dwell in the house of the LORD forever. No matter whether you are born in the year of sheep or not, let me bless you a fruitful and joyful new year. Pray to the Lord and tell Him that you would like to be His sheep in your whole life following Him. May the Lord bless all of you in your learning and your personal growth. Thank you for your attention.